Native-born English musician Alexandra Scott started her musical training at the Yehudi Menuhin School in London. After that she studied at the Guildhall School of Music and Drama with Rinat Ibragimov, and while she was still a student she became a member of both the European Union Youth Orchestra and the Gustav Mahler Youth Orchestra. 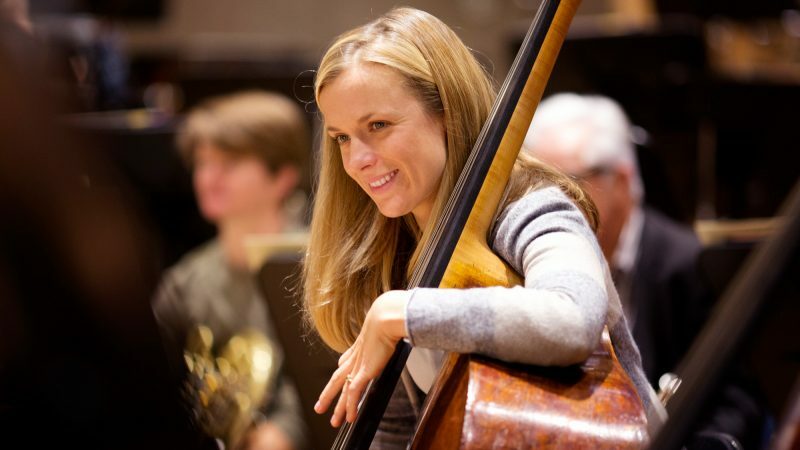 In 2005, Alexandra Scott began to study at the Orchestra Academy of the Berlin Philharmonic, where her instructors included Klaus Stoll, Janne Saksala and Esko Laine. At the age of 23 she became first chair double bassist in the NDR-Radio Philharmonic in Hanover. Since 2007 she serves as debuty principal player in the double bass section of the Symphonieorchester des Bayerischen Rundfunks. Alexandra Scott is a dedicated chamber musician and makes frequent appearances at renowned international music festivals together with such artists as Lisa Batiashvili, Vilde Frang, Valeriy Sokolov, Gautier Capuçon and Eduard Brunner. She is a regular guest artist with the Chamber Orchestra of Europe and the Mahler Chamber Orchestra and is a founding member of L’Accademia giocosa, a baroque ensemble with members of the Symphonieorchesters des Bayerischen Rundfunks. Alexandra Scott is also a devoted teacher. Since 2012 she has held a professorship in double bass at the Music Academy in Karlsruhe. Beyond this, she also works as an instructor at the Bavarian State Youth Orchestra, the Young German Philharmonic and the National Youth Orchestra of Great Britain.